Referrals and partnerships are great. And together with Inbound Sales, you will sell more. Referrals are key to sales, arguably the most powerful method you have. After all, people are 4 times more likely to buy when referred. Furthermore, networking, forming strategic partnerships and building personal relationships, when done effectively, will enhance the quality and quantity of your pipeline. But if you want to propel your sales to another level this year, adding the inbound sales methodology to your approach will increase your revenue, at a lower cost. Inbound sales focuses on the buyer, their needs, goals, and pain points. Put simply, it’s sales that attracts prospects to you. The approach involves first creating content that makes prospects aware of who you are and attracts them to your offerings. From here, when you reach out, they are already warm leads that have a good understanding of what you offer. This will lead to more closed deals. The key is to follow the buyer’s journey, the stages any prospect goes through before buying your services from awareness, to consideration and decision. How Could This Help Me? Of course relation based selling and referrals will remain a key part of your sales plan. But, even if someone is referred by a friend or part of your network, you still need to be able to close the deal regardless. Therefore, knowing their needs through buyer persona research, and understanding what stage they’re at on the buyer’s journey, all part of the inbound process, is even more important. In order to provide an effective solution, you need to understand their goals and pain points, then create quality content that appeals to them and positions yourself as a thought leader in the industry. Do this, and not only do you have a referral and relationship to begin with, but they also see you as the leading organization that they will want to work with. When you reach out from here, you'll be able to speak directly to their needs. Everything you do will be more tailored to them, and when sales is about the customer, they're much more likely to buy. Furthermore, I imagine you're a little tired of constantly fishing for those referrals, drained from the high cost, long hour, networking events, and frustrated that your partners aren’t moving forwards with the times like you are. Why not add another weapon to your arsenal? When you look at the magic that inbound can bring to both what you’re already doing, and what is possible, it’s hard to argue against it. 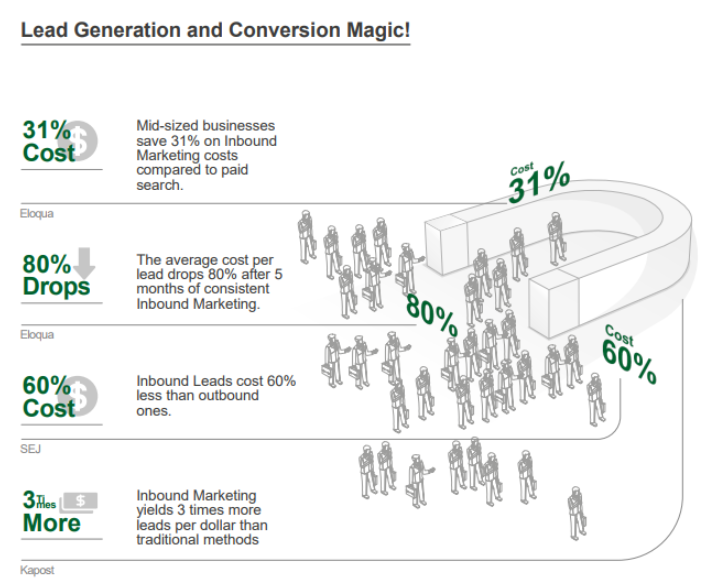 It’s not just in lead generation that inbound is proven to generate results, but conversion too. In fact HubSpot saw 42.2% of companies using the approach increased their lead to sale conversion rate and 49.7% of organizations increased sales in only 7 months. Now you see the benefits that are available, it’s foolish not to consider inbound sales as part of your strategy going forwards. What we often see is that the main reason people don’t adopt the methodology is based on a fear of change. But for 3 times more leads per dollar and a greater conversion rate, the change is more than worth it. The time for inbound to complement your relation based approach is now!